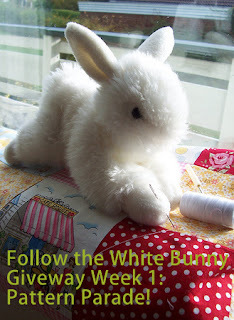 Follow the White Bunny: Giveaway week 1: Pattern Parade! Giveaway week 1: Pattern Parade! In a few posts time my 300 th blog post will be up on this blog. To celebrate this small milestone and to thank you as a reader of this blog for your visits and comments I'm having a rather marvelous giveaway for the next three weeks. Yay! I will have a different giveaway each week and of course you are free to enter them all. If you are not a blog follower already I would appreciate it very much if you would become one! (update: just to be clear there's no need to follow, only if you like!) You can also find me regularly on my Facebook Fan page. All you need to do this week is to comment on this post and let me know your thoughts about my little blog. :) Any ideas for new stuff are very welcome too! Please make sure you leave some kind of trail (email address, blog) so I can contact you in case you are one of the four lucky winners. You can enter this giveaway until Sunday the 7th of November 12 am CET. (update: by which I mean Central European Time) The winners will be announced later that day. Because I believe it's more fun to have multiple winners I'm drawing four winners (one prize each) from the infamous Stroop Waffle Jar. It is not possible to give preference to one of the prizes. Prize #1 a Fantastic Embroidery E-book by Carina! If you have been following my blog you may have seen my half finished version of the semi-Fantastic Mr. Fox. 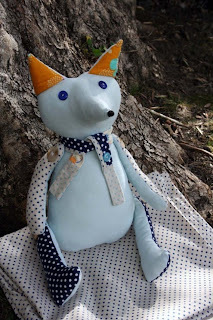 Well, Annie of Bird and Little Bird offers not only the totally Fantastic semi-Fantastic Mr. Fox PDF sewing pattern but also the equally cute Mostly Ms. 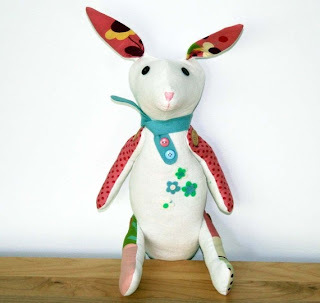 Marvelous Bunny PDF Pattern! Prize #3 How about sewing your own stylish (Follow the White) Bunny with this adorable Bird and Little Bird Pattern? Magpie Patterns has a wonderful selection of sewing, knitting and embroidery patterns. One lucky winner can choose any PDF Pattern from the shop! 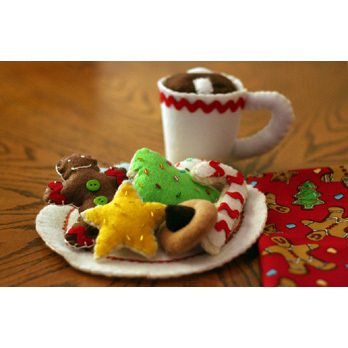 Take your pick from the many Magpie PDF Patterns available.Like this cute felt cookie project by Sweetie Pie Bakery! What an awesome giveaway Nicole!! I would love to be entered. I love your blog and cannot think of anything to improve or add to it - sorry!! Thank you for this opportunity. - Congrats on your 300th post!! love everything you're giving away! and it's so nice of you to do it! I love your blog and wouldn't change a thing ... oh, I also follow you on facebook! what a great give away! i hope in the future you will continue to the tell the "stories" behind how you came up with you embroidery patterns. it's fun to see where you got your inspiration from. Cool giveaway. I love your blog and stitching. I never miss a post. Ooh, what a nice way to celebrate, by giving gifts away! I love your blog; the stories behind patterns, your adventures in new stitches. A great giveaway! Thank you! 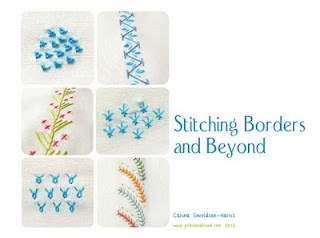 I really enjoy your blog and reading the development process that goes in to creating and adapting your designs, I've also enjoyed your stitch ideas (the peacock and brick stitches) and would love to read more of those as they are quite different and inspirational! I would love to enter! I love following your blog and seeing all the fun stitchy things you are able to do! I love your 'follow me' embroidery! I just finished it and I have received SO many compliments! I'm a lurker,now a follower! Love your stitching - more of the same please! Your embroidery patterns are what turned me onto Hand Embroidery. In fact, I just completed your Princess and the Pea pattern to add to the center of a doll quilt for my daughter. I definitely wouldn't change a thing about your blog. I'm already a follower, of course, my friend :D and really love your blog and your beautiful embroideries!! What a lovely give away! What I want is my very own white bunny to follow for myself. :) Have to get cracking and make one, eh? your blog is adorable! and your needlework is amazing! definitely inspires me to work up to one of your sweet patterns! What a lovely giveaway - lovely prizes! You are lovely for doing this. Congrats on the 300 (or almost?) posts! Hi there! It's so generous of you to host such a wonderful giveaway, 300 post is a milestone worth celebrating if you ask me. I love everything about your blog (starting by its name) and i'm a follower. Great prizes! Would love to be entered. I love your blog, everything just looks so pretty! Maybe putting the labels from your post on your sidebar will make it that much easier to navigate your page and find what you're looking for! Thank you for this great giveaway! Congratulations!!! And thank you for your generosity!! Great giveaway. I am new to your blog so all looks wonderful to me. I have seen your work before since I have long loved that cute stitched fox pattern in your Etsy shop advertisement. Being a big embroidery fan, I can't believe I haven't heard of Polka & Bloom before! So excited to discover it and I'll be dreaming of winning that little E-book too! I'd love to be entered in the drawing. I follow you through Goodle Reader. Embroidery, hand stitching and plushies! Three of my very favorite things! Thank you for hosting such a wonderful giveaway! I love to hand stitch! Thanks for the chance to win! Am a new follower :) Now, I'm off to explore your blog! Found you from Craft Gossip. I love watching your designs come together! I have a few at home waiting for me to get stitching...I think I will start on the Princess and the Pea!! You know I love your "little" blog! I think more pictures of in progress work might be fun, but I understand that sometimes you just can't share that kind of stuff. Oh, and I really like the stitch challenge idea - being able to suggest stitches for you to try is such a fun way to participate! I'm working away at the Princess and the Pea, loving it, and loving this blog! I love seeing your finished stitched designs, they're all so beautiful. Thanks for the chance to win some excellent prizes! Congratulations on your 300th blog. Your gift choices for the giveaway are awesome and so is your blog style. I am a new follower and look forward to more cuteness from you! Thanks for the chance to win a sweet giveaway!! What cute ideas! Thanks for the giveaway! I just found your little blog via Craft Gossip and I love it. I'm a follower now! I love the bunnies! I'm going to make sure I follow your blog so I don't miss out on your giveaways. I love these patterns and this giveaway. I just found your blog. going to be coming back to it often. thanks. Oh yay, what a great giveaway!! You do such beautiful work and I loved the embroidery pattern I got from you. Thanks! What a wonderful giveaway. The e-book lokks really great as do the patterns. I have become a follower. I have been following you for over a year now - you do such great work! And I sure wouldn't mind winning one of these prizes! Congrats on 300 posts. 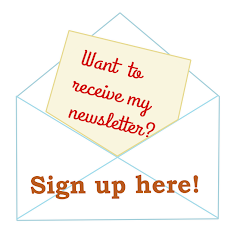 I am a fan on facebook and receive your emails. Your patterns are adorable. What a great giveaway! I love your blog as is, but I will say that I love tutorials or little freebie patterns too! I have to say I adore your patterns. I have a couple sitting here waiting for the cold winter months and a cup of tea. Love your little piece of the blogging world. Keep up the good work. What a sweet giveaway! I adore you, your stitching and of course Mr. Squirrel. That's quite an accomplishment--300 posts. Congratulations! And what delightful giveaways. Thanks for the chance. I'm new to embroidery and have been greatly enjoying your blog! I'm returning to embroidery after a 30 year hiatus. I love seeing your stitching tutorials. 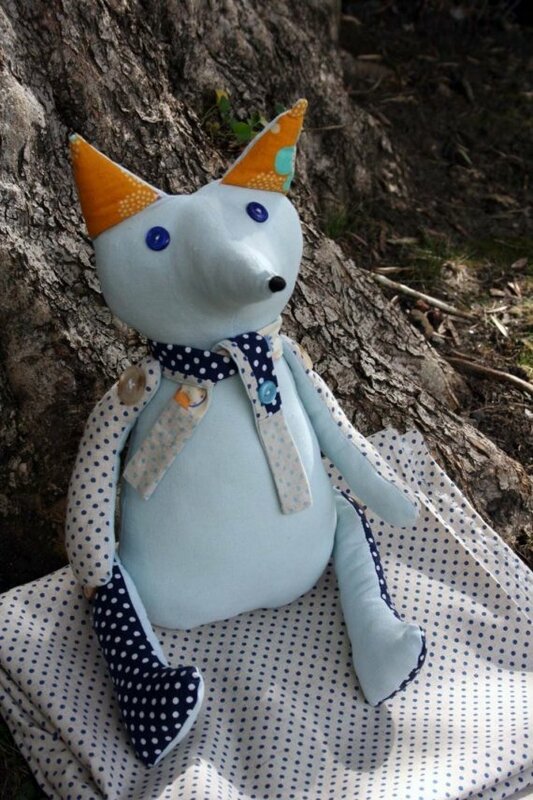 I'm also a sewer/quilter, and I am absolutely in love with the Fox! I am an avid follower of your blog! Thank you for the inspiration! Here is my "Bunny blog" summary- from so many lovely craft blogs that are "out there", yours is a high priority blog for me. I have enjoyed getting to know you through your awesome blog and now have become a follower and a facebook friend. I look forward to seeing more of your designs. I've been following your blog for a little while now, and there are so many things to love about it. I really like the length and frequency of your posts - not too much, but just enough to give us all a lovely little dose of crafting sunshine! It also has such a friendly feel to it. Looking forward to reading many more posts in the future! I'm entering too :) My son is obsessed with your toy bunny at the top of this post, btw, insisting that it's the little bunny from The Runaway Bunny. I love your blog! So full of inspiration! Thank you for the opportunity to win.